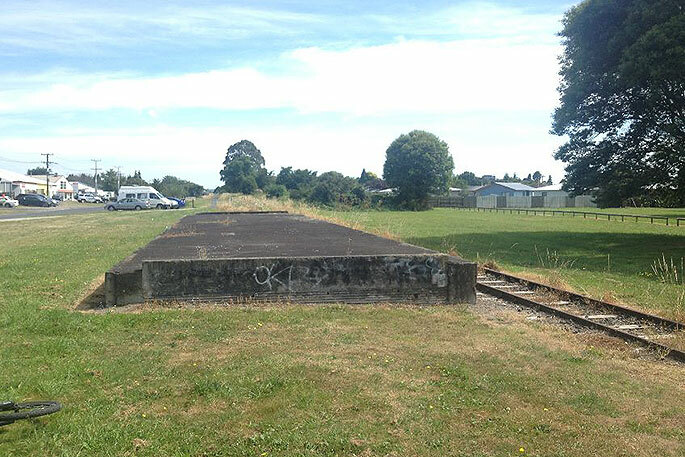 Once was: the foundation of a temporary railway station, a reminder of a service to Auckland. In the distance, beyond the motor vehicles, the railway track and cycle way disappear into the distance. It’s the cyway or the hyway in Rotorua. The Pennine Way it’s not. 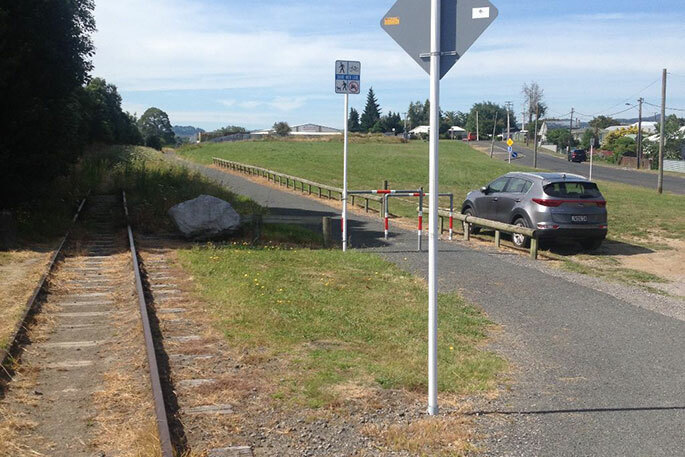 But once you accept an interesting way for pedestrians and cyclists to commute in comfort, the route between Rotorua and Ngongotaha palliates the rush of constant, demanding vehicular traffic. The one jarring theme is the glib ‘cyway’. Simply, the term is terrible, though who is to say it won’t enter the venerable OED? It sticks between denture and gum as you pronounce it. For cyclists who use the cycle-pedestrian lane from Lake Road through northern entry options into Kuirau Park thence to the inner city, the route is peaceful. Encapsulated in a few moments of bliss with nature – the hot pools bubble in iambic pentameter and birdlife flies near, trusting the human forms as they flit in kahikatea trees and brush etc – the public is given a rare wander around classified tracks unaware of regulation hustles of heavy traffic nearby. Signs: how far you’ve walked or cycle, how far to reach various points. Steam from geysers offer the best free show in row. Very soon, if paced quickly, the admirer of unalloyed nature ventures towards town; if on bicycle generally clear if paint faded signs denote a cycle route. Here the real and genuine criticism begins: the one mistake our city burghers have made. A route towards the southern frill of Lake Rotorua would have been acceptable. Forgotten in his row, however, is the shortish route between Rotorua and the throbbing village of Ngongotaha. 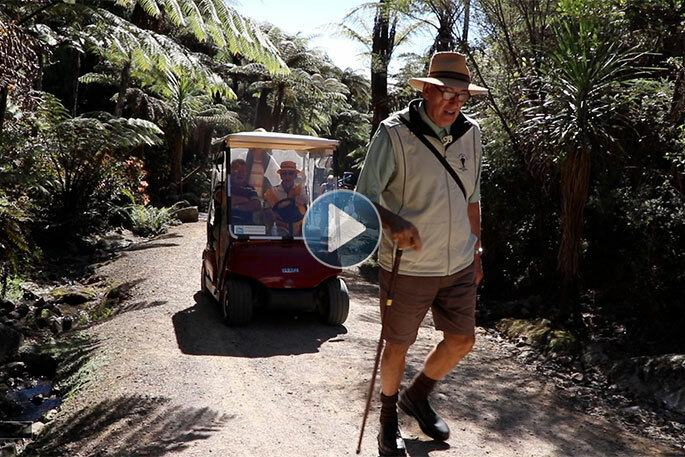 The local council produced a six-minute video of this route some time ago – it attracted 296 hits as of this week, make that 297 – which featured a council functionary named Hugh. 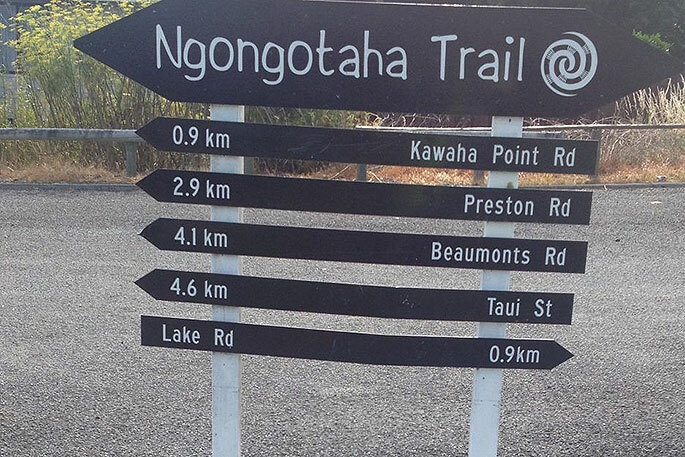 The Ngongotaha track was installed years ago, and improved on. Width-wise, it can hold cyclists at three-abreast, two horses ditto and a mother pushing a perambulator with hyperactive twins. For some sections, it is also a route for school children, lone cyclists, walkers and casual pedestrians. The start of the line, or start for our story, is at Lake Road. A cyclist pedals to distant Ngongotaha. A solid slab of concrete is a forlorn battleship grey vestige of the last bid by locals to retain some form of rail. It was here the late Greens co-leader Rod Donald in the mid-2000s pleaded with authorities not to close the service. Economics won. No urgency is evident. The route crosses some of our busiest streets. 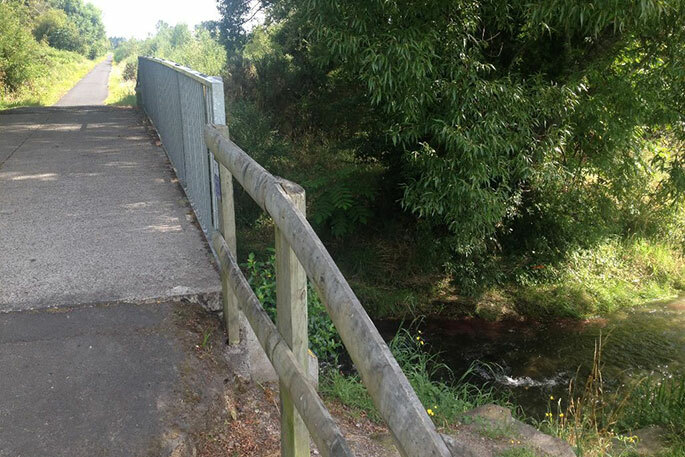 The short drag comprises bridges over two streams (one the Waiwhero Stream) which ripple into Lake Rotorua. The entire route is cast in bitumen and seems the only are not affected by the present intense summer. It has not bled unlike dozens of roads and streets. The cycle lane is sandwiched by the main highway 200 metres away and Lake Rotorua. Most using this largely unloved route – for expediency travel here in peak periods is quicker than by car – find an ethereal relaxation. Apart from the two short bridges – could the humps earn the moniker of Dromedary Lane – the route is flat. It crosses Russell Road, then to Frank Street, a lane in which a whiff of a wad of herbs in certain airs clear nasal passages. To the left, tangles of brush and bracken cover the neglected railway line, though parts of the line (owned by NZ Rail) are visible, a reminder of the times of a regular train service between Rotorua, the Waikato and Auckland. The lines remain in case rail is restored. 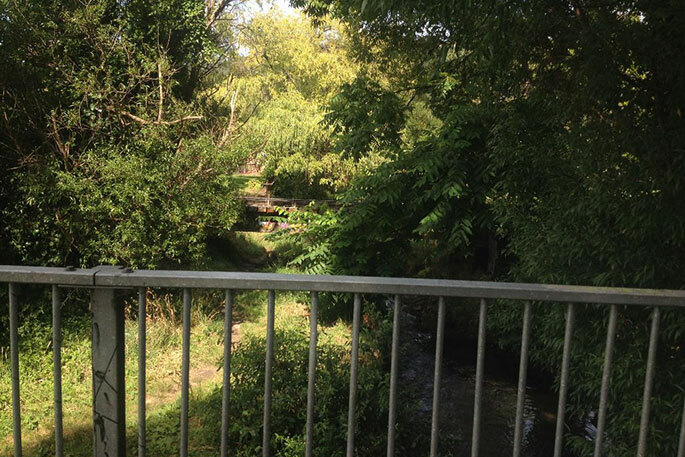 From one of two bridges, a view carries over a rivulet to the adjacent railway line. 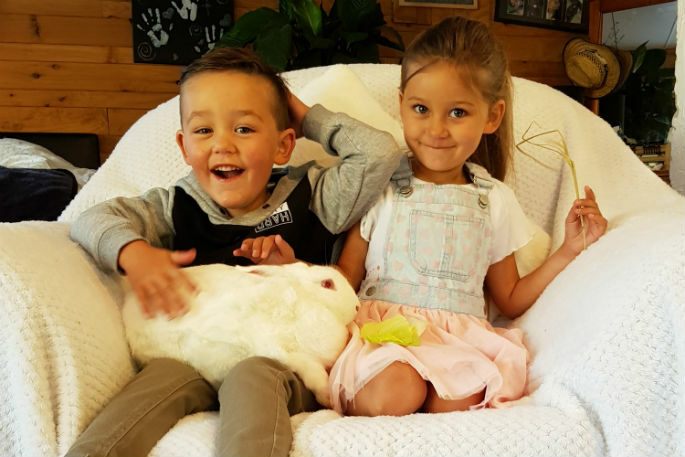 Until the adventurer reaches the Ngongotaha village – the climb over the half round span across the Ngongotaha Stream is best tackled with a licketty-split ride to the approaches – the track passes paddocks and fields, in which animals graze, and thickets of native bush. A pause to listen to the ripples of the brooks as they babble towards Lake Rotorua affords day-long protection from the beating sun. In moments of repose, the railway lines come into view. Once off the track – barriers at both ends to deter motor traffic – the ride takes you past two waka as you head towards Ngongotaha. There, a lane passes a domain on which celebrated All Blacks from the village started rugby life. The track takes a rambler/cyclist to a glimpse of railway yards of engines and carriages lost to desuetude, then along a track to the northern residential home. And, terminally, the end. 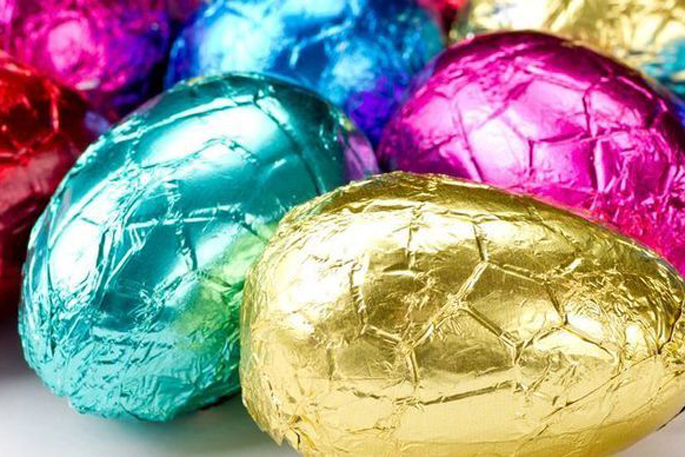 Should you do the round trip, the main route from Ngongotaha to Rotorua also has its attractions. 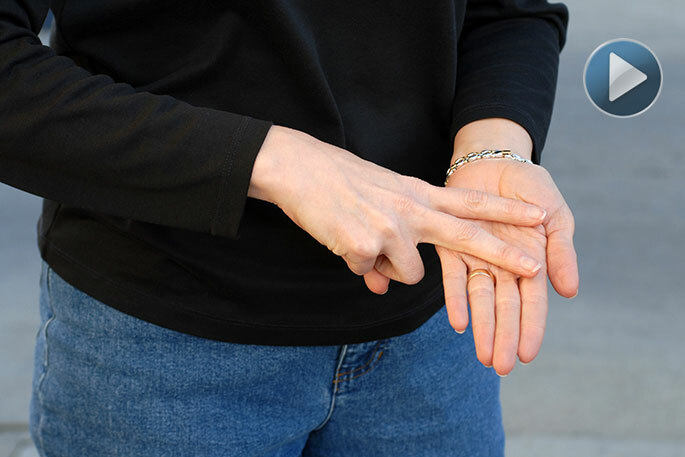 As everywhere these days, a care and share footpath ensures safety – nearly. Years ago, when this innovation entered vogue transport, I asked a law enforcer who would be liable should a motor vehicle driven backwards crash into a cyclist legally using the footpath? He had no answer. A brook, a tributary, to the right ripples toward Lake Rotorua. Not that the care/share footpath is ever densely populated. Opposite the Kaue Cemetery, open spaces allow advertising hoardings, usually a neon of splendour and pithy statement at each political cycle. As we approach Rotorua, from the Mitai Village south, a curiosity: some of Rotorua’s greatest attractions sit here, at Fairy Springs. Fast food outlets close to schools are cube like yet colourful. A map (Google?) highlights some petrol stations, a winery and fast food digs, but not others – not the long-established McDonalds or Burger King or Wendys. Nor is the corner of Lockwood, the city’s greatest export, mentioned. Nor car dealerships. Soon, our trip nears its end. 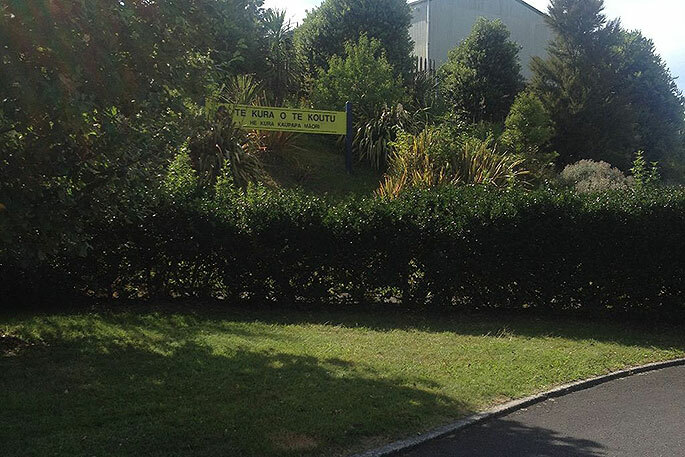 A left turn from Fairy Springs into Russell Road returns us to the railway track, to the approaches of Te Kura o Te Koutu, a Maori immersion school. Then to the slab of railway concrete where our trip began. Not the most romantic of rides. But not one to overlook. 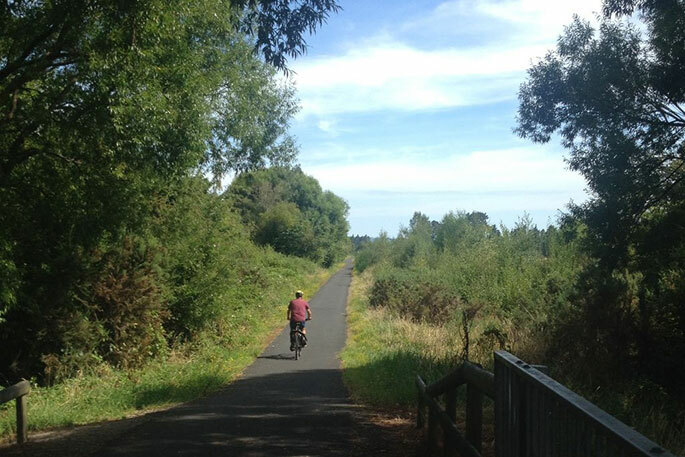 By Rotorua measures, though, the route is one of the more relaxing and stress-free rides in the district. Te Kura o Te Koutu – one of the sights en route. A kilometre from busy Lake Road, looking south, the lane and railway line run parallel. 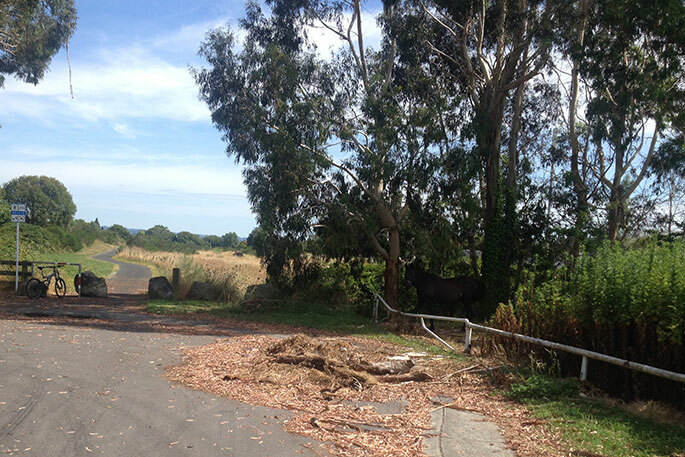 In the shadows, a horse grazes over a barrier; two boulders block vehicular traffic.